From the publishing house of the British Library comes Lost in a Pyramid & Other Classic Mummy Stories, a collection of twelve tales selected and edited by Andrew Smith – a knowledgeable reference of Nineteenth Century Gothic English Literature – and originating from the Golden Age of Egyptian-based British horror between 1869 and 1910. The first origins of this type of story are said to have come from the British strategic interest in the Suez Canal and its discoveries uncovered in Egyptian tombs. Some of these writers are known to many, such as Sir Arthur Conan Doyle, author of the world famous Sherlock Holmes stories, Louisa May Alcott, writer of Little Women, and Sax Rohmer, author of the Fu Manchu series of books; however, there are also some more obscure offerings and those which, hitherto, have never seen the light of day. The beautifully understated cover artwork is by Rawshock Design. In Lost in a Pyramid, or the Mummy’s Curse, by Louisa May Alcott, an archaeologist and his daughter become lost in an Egyptian tomb and burn whatever is to hand, to ensure their rescue – including a Mummy protectively clutching tiny seeds. In A Night With King Pharaoh, attributed to Baron Schlippenback, KSL, two British explorers are tricked and left to die in the depths of an Egyptian pyramid. In My New Year’s Eve Among the Mummies, by Grant Allen, an explorer has a restless night and so explores the tomb he should be entering the next day with his expedition, only to stumble upon the long-dead pharaoh and his gathering enjoying a grand banquet. In Professor Petrus, by Justin Huntly McCarthy, an aged adventurer tells a young man setting out on a similar path in life, of his encounter with an expert on historical Egyptian culture, and his obsession with discovering the man’s dark secret. In The Curse of Vasartas, by Eva M. Henry, a traveller takes the newly discovered Mummy of an archaeologist to England, but soon receives a desperate message to return it to Egypt on pain of his friend’s life and that of his daughter in England. In Lot No. 249, by Sir Arthur Conan Doyle, a mature student at Oxford University has an Egyptian mummy in his rooms, which he purchased at auction. An associate warns a young student about the man, but it isn’t until individuals who have crossed the man are attacked by a barely seen figure that he begins to realise the danger he is in from the man and his possession. In The Unseen Man’s Story, by Julian Hawthorne, a young traveller is advised to visit certain parts of Egypt and to seek out a very unusual individual. The strange man tells him he was born to serve an ancient queen. In The Story of Baelbrow, by Kate and Hesketh Prichard, a resident ghost becomes notorious, much to the amusement of the owner of the house, until it begins to seriously hurt people, and a friend determines to get to the bottom of its origins. 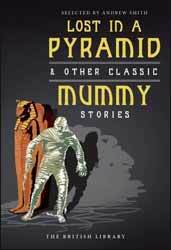 In The Mysterious Mummy, by Sax Rohmer, an antiquity from an Egyptian collection on display in a London museum, mysteriously disappears. Is this part of an ancient curse or something much more mundane? In The Dead Hand, by Hester White, an officer in the British army, acquires the hand of an Egyptian mummy; and so begins a string of bad luck. In A Professor of Egyptology, by Guy Boothby, a Greek professor hypnotizes a British lady and takes her to an Egyptian tomb, where she experiences a personal link to the ancient past. In The Necklace of Dreams, by W. G. Peasgood, we are told a story of ancient Egypt relating to a rare antiquity, which still holds a dangerous power in the present. I am not only a long-time lover of horror fiction but particularly enjoy the formal writing style of the nineteenth and early twentieth century. I have several leather bound collections, including H.P. Lovecraft, Edgar Allan Poe and M.R. James. So any new collections along these lines are always welcome. In fact, it’s a shame this isn’t in hardback. The format here is to say a little about what is known of the author of the individual tale. My only quibble is that right afterward, almost as an introduction to the story, the plot points are mentioned which rather spoils the magic of uncovering the outcome yourself. I found myself reading each short story first before going back to the editor’s comments. In this manner, even the synopses above are my own interpretations. What really surprised me here is the lack of diminishing returns. In other words, how many variations on a theme of Egyptian curses and mummies coming to life can you have? Well, the answer is quite a few, it seems, and this is testament to Smith’s eclectic mix which has been gathered together here with more than a little thought and balance in mind. I enjoyed immensely the reading of these classics from the golden era. My fear is that younger people than me, who have grown up expecting constant action, whizzes and bangs, will sadly and short-sightedly find anything from this era wanting. Many of this era’s tales take a page or two to get started, as one gentleman tells another gentleman about a third gentleman’s gentleman friend who told him about a strange event! The Sherlock Holmes stories are from this period setting (except for the contemporary Sherlock series) and are still adapted for TV on a regular basis, so it proves subject matter from these times still have relevance. This book took me back to my childhood when little books on shop spindles depicting Uncanny, Suspense, Eerie or Creepy Horror seemed much more common. Innocent days. I found that I preferred the mystery-related versions present in stories eight and nine. The final story doesn’t involve a mummy, and the tale before it only in the loosest sense. But I found it didn’t matter; the collection is more than welcome, all the same. So, in conclusion, this is a damn fine read which should attract the regular horror buffs and fans of the halcyon days of Hammer Films. I look forward to any subsequent horror or mystery collections from the British Library in a similar vein.